Howard Gardner of Harvard has identified eight distinct intelligences. This theory has emerged from recent cognitive research and "documents the extent to which children possess different kinds of minds and therefore learn, remember, perform, and understand in different ways," according to Gardner. This theory of multiple intelligence states that each one of us learn about the world through all these intelligences; visual-spacial, language, music, logic, nature, body, understanding self and understanding others. Where individuals differ is, in the strength of these intelligence's, i.e. some of these are seen as dominant intelligences that aid to carry out different tasks, solve diverse problems and progress in that particular domain." Let us understand how the Montessori method caters to all the intelligence's of a child. 1. Visual-Spatial - Children who are visual learners are very aware of their environments. They like to draw, solve jigsaw puzzles, read maps, daydream. They can be taught through drawings, graphics, flash cards, photographs, 3-D modelling and text with pictures. 2. Bodily-kinesthetic - Majority of people are kinesthetic learners, specially very young children. The entire Montessori curriculum is designed to give children hands-on learning experiences. Children with dominant kinesthetic sense enjoy movement, making things, touching. They communicate well through body language and can be taught through physical activity, hands-on learning with real objects. 3. Musical - Many children show sensitivity to rhythm and sound. They love music, but they are also sensitive to sounds in their environments. They may learn better with music in the background. They can be taught by turning lessons into lyrics, speaking rhythmically, tapping out tunes and other music lessons. 4. Interpersonal - This intelligence is evident after 2 and a half years of age. However, we work towards creating a social environment from a very young age. We encourage children to sit for small group presentations, share materials and take turns. Children who are "people smart" usually are seen easily mingling with friends and show empathy towards others. They can be taught through group activities, role play and dialogues. 5. Intrapersonal - These children tend to shy away from others. They're in tune with their inner feelings; they have wisdom, intuition and motivation, as well as a strong will, confidence and opinions. They can be taught through independent study (one on one) and introspection. They are the most independent of the learners. Very young children are usually seen having strong intrapersonal skills, till they come in contact with the social environment away from their home environment. 6. Linguistic - Children who are word smart learn effectively through words and rhymes. These learners have highly developed auditory skills and often think in words. They like reading, playing word games, making up poetry or stories. They can be taught by encouraging them to say and see words, read books together. 7. Logical -Mathematical - Children who are math smart enjoy activities that involve reasoning and calculating. They are able to think conceptually, abstractly and are able to see and explore patterns and relationships. They can be taught through logical puzzles, investigations, mysteries and math hands on tools. They need to learn and form concepts before they can deal with details. 8. Naturalistic-If a child is 'nature smart' he or she is able to pinpoint things in their surroundings that others often miss. This child likes animals, appreciates being outdoors, shows empathy towards plants and likes working with natural materials. 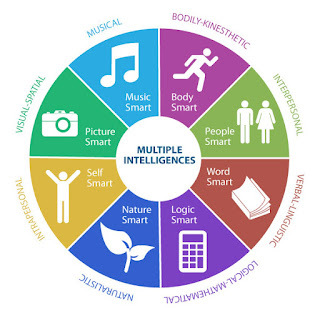 We, at Casa Vista Montessori offer this holistic environment where there is room for each of these intelligences to develop and nurture. A curriculum that is planned keeping the multiple intelligences in mind, yields the best results. When such a theory is applied, learning not only gets simplified but is also exciting for the child as they learn according to their learning style. Are you curious to find out what kind of a learner are you??? Click on the link attached below. The online results, will show you, your dominant intelligence.